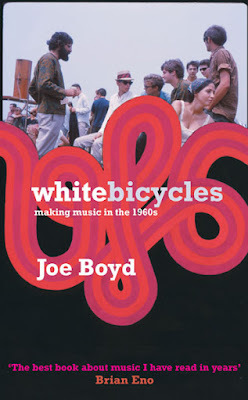 Back in 2006 Joe Boyd’s acclaimed memoir, White Bicycles: Making Music in the 1960s, was published. I was trawling through a crate of old minidiscs (whatever happened to the minidisc!?) and I found a recording of a fascinating interview from BBC Radio 3’s Mixing It programme (August 2006) – the show is now defunct, of course. This special edition was presented, as always, by Mark Russell and the late Robert Sandall. I have dematerialized the the now Jurassic disc into MP3 format and uploaded it for your listening pleasure. The 60 minutes or so are mostly taken up with a discussion of various events and characters, and some readings from White Bicycles. But, there are also snatches of music from some of the artists he worked with, including the Reverend Gary Davis, The Incredible String Band, Syd Barrett, Nick Drake, and others. Incidentally, it is one unbroken MP3 – you can’t skip through it, so it is just like listening to the broadcast. A playlist is still up on the BBC website, detailing the tracks played. I’ve just been looking around online and it seems that Boyd now has a radio show of his own, streaming online or in podcast format, at London’s Resonance FM. The first of these shows seems to have been last week – there are some more details here at Boyd’s website.